Yes4All Collar Lock Adjustable Dumbbells Review - 40 - 200 lbs! These are gym quality dumbbells which are not cheap plastic ones. Real feel and the real deal! Solid chrome bars – sharp looking! gym quality at a cheap price! View discounted prices on amazon here. Adjustable dumbbells are one of the best pieces of fitness equipment you can buy to workout at home with. They by bar are the most versatile piece of equipment that will allow you to do the most exercises with a single piece of gym equipment. I’m going to introduce you one of the best dumbbell sets you can buy for your money which are Yes4all Collar Lock Dumbbells. Yes4all sells a variety of fitness equipment and they it for cheap prices while the products are high quality. If you are starting a home gym, dumbbells are definitely your first piece of equipment you will want to buy along with an adjustable bench next. These two pieces of gym equipment will allow you to do dang near any exercise you need to workout at home and to do any type of advanced strength training exercises you want to accomplish. Handles are chrome coated and relatively coarse textured to provide a secure grip. They have cast iron constructed weight plates for durability. The dumbbell sets start from 40 pounds and go all the way to 200 lbs. Spin Lock star collars to secure the weights on each side. What are the advantages of Yes4All Collar Lock Dumbbells? Has a standard bar with a diameter of 1.5 inch making it possible to add any weight you desire. One of the biggest benefits of buying this item is the fact that they need no maintenance. It also saves you from buying a ton of regular dumbbells to get this many weight options. They last for a very long time provided you don’t drop them on an extremely hard floor. Just like other adjustable dumbbells, this one too uses up little space. Dumbbell press– just like bench press, dumbbell press aims at improving your chest and arm muscles. Dumbbell Incline Press – varies a bit from the dumbbell flat press and is mainly done to hone the upper chest muscles. Dumbbell bicep Curls – it’s one of the most practiced dumbbell lifts and gives the biceps a thorough beating. Dumbbell Shoulder Press – works on the shoulder and upper chest muscles. You must support your back with something while performing this exercise. Dumbbell Squats – they are a core part of any workout regime and are normally combined with lunges for maximum outcome. Dumbbell Tricep Kickback– done to improve the triceps. From the list above, it is evident there are a lot of exercises you can do at home with the Yes4All dumbbells. All this can be done at your place and at any time you see fit. Yes4All Collar Lock Dumbbells are available on Amazon and other online fitness stores. However, many people find Amazon prices to be friendlier. Remember, this equipment comes in various sizes. Therefore, whatever you’ll get will be equivalent to what you paid for. Reviews and rating from previous clients together with consumer reports form a good basis for buying a product. There are over hundreds reviews left for this bodybuilding product and over 60% of them are the highest rating while less than 4% a lowest rating. That pretty impressive. In general, many people found this product to be a great purchase. Yes4All Collar Lock Dumbbells are versatile and offer both seasoned and beginner bodybuilders an excellent service at a lower price. They are stable and durable and rarely occupy much space. 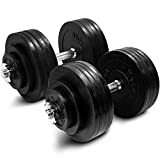 So, if you are on a journey to build your muscle and don’t have a lot of cash to throw around, Yes4All Collar Lock Dumbbells are one of the best options out there for the money. I do have other options available in my Best Adjustable Dumbbells review article that are are worth considering if you want a different style that what I have mentioned above. I personally love these because they have a natural feel that I have been used to for over 20 decades of lifting weights in the gym. The round plates and regular dumbbell feel are there for me just like I’m at a high priced gym. It’s a way different feel say from the power block dumbbell style. So, to each his own I guess but for me I wanted what I have been using for years and I like how close I can get the dumbbell to my chest vs the block style.